Jalel once wanted nothing more than to leave his country. Like many of his friends and other youth across Tunisia, he was faced with a wide array of challenges, which made his future appear very difficult. Many of the youth he knew were willing to give anything to leave the country: some were ready to go to extreme lengths to make a future for themselves, even willing to join violent extremist movements in Libya and beyond. For him, the ultimate goal was to cross the Mediterranean to Italy or France – to become a migrant. Anything was better than staying in Tunisia, where there was no safety, no job, no prosperity, and no hope. He desperately sought out ways to make the crossing – all of them extremely dangerous. Around the time when he was feeling the most desperate, a Generations For Peace (GFP) programme kicked-off in the school he was attending. When the programme began, he showed little interest in the activities designed to strengthen youth resilience to violent extremism through positive sport and arts alternatives. At the time, Jalel was weak in his studies and ultimately dropped out of school a few months after the programme had started. He was not interested in sport and arts: the only positive alternative he saw for himself was a new life in Europe – no matter how difficult that life was to be, it was still better than the one he already had in Tunisia. But the group of GFP Tunisian volunteers running the peace-building programme at his school was persistent. The volunteers were all school teachers – real-life, frontline workers – who knew well the dilemmas and issues with which the youth in their classrooms were confronted. When the programme participants showed lack of interest, they adapted the content of activities, refurbished clubs in which the activities were taking place, spoke with parents and headmasters and sought their active support, used social media to promote the programme in fun and appealing way, and went an extra mile to ensure the school youth will actually have their say in the activities and design and lead the community initiatives that were intended to bring good to the communities. Their persistence has paid off time and time again, as their efforts bring formerly disinterested students around the world back to their studies and programmes. Almost a year after the programme had started, Jalel returned to his education and, in the process, started becoming involved in GFP’s programme. Deepening his friendships with his peers and steadily increasing his interest and engagement in activities, he was able to alter the path and mindset that had originally led him to drop out. He started to follow training sessions on empowerment and leadership, passing the learnings on to others quickly thereafter. 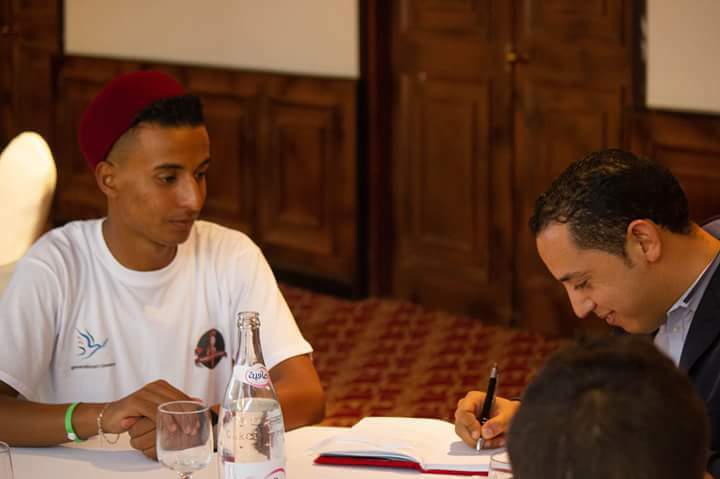 With a group of other students, Jalel engaged in a range of initiatives, including the production of a documentary on immigration, raising awareness on the potential dangers of emigrating and on the fact that people are needed to rebuild Tunisia. Their film, “The Other Righteousness,” showed families struggling to cope with their children’s decision to emigrate to another country. Each project he has undertaken has allowed Jalel to become involved with various groups and peers. By the end of each initiative, he had increased his social and leadership skills, becoming more and more interested in teaching, volunteering, and passing on his knowledge and inspiration to those around him. With the power to unite people and help bridge the often violent barriers that have risen between individuals and communities, volunteering is one of the most impactful and sustainable forms of peacebuilding. At Generations For Peace, volunteerism is at the heart of each programme implemented across 50 countries and four global regions. GFP’s commitment to its volunteers is deep: with over 10,700 volunteers across Africa, Asia, Europe, and the Middle East, its goal is to empower youth in conflict-torn communities in order for them to help their communities to overcome the challenges they face, raise a sense of understanding between conflicting groups, and build social cohesion across often opposing communities – all from the grassroots. On that inspiring but very difficult journey, GFP supports its volunteers at every step of the way: from initial training to design of their own activities to building of local partnerships and involvement of the whole community in the evaluation of programme impacts. GFP volunteers are part of a global network of young people who exercise leadership – not receive leadership lessons given by adults. Their engagement in GFP programmes comprises lots of work ‘behind the scenes’ but is also increasingly allowing for their place at the negotiating table in full participation – not as mere representatives of youth without voices to raise, but as active participants. Jalel paints a wall in an initiative to improve his community. He has found a way to bring hope closer to home. Jalel’s once desperate desire to leave Tunisia has now completely vanished. He no longer sees a future in his home without chances or opportunities to improve himself, his peers, and his community. Instead, he has developed a relentless desire to give back to his own community – the community he once dreamed only of escaping, now transformed into a safe space to develop himself in order to empower others.